To use the Network Administration Tool, you must have root privileges. To start the application, go to the Applications (the main menu on the panel) > System Settings > Network, or type the command system-config-network at a shell prompt (for example, in an XTerm or a GNOME terminal). If you type the command, the graphical version is displayed if X is running; otherwise, the text-based version is displayed. 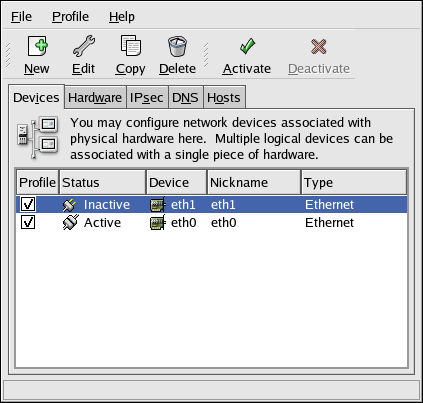 Use the Red Hat Hardware Compatibility List (http://hardware.redhat.com/hcl/) to determine if Red Hat Enterprise Linux supports your hardware device.